In a previous Rosadyn article titled, “Top Five Sunblocks for Rosacea Reviews” we examined five cutting-edge sunblocks with high concentrations of microfine zinc oxide that are great for rosacea-sensitive skin and doubled as excellent skin protectants to external triggers such as sun, heat, cold, wind and skin care products. It was also emphasized that topical zinc oxide heals thin rosacea skin and desensitizes hyper-reactive skin when microfine zinc oxide is used in skin protectants at a concentration of 4% to 8%. These skin protectants are not just helpful against summer sun and heat but a soothing, anti-inflammatory skin protectant can protect and heal rosacea skin year round. Rosacea specialists have demonstrated that the outer layer of rosacea skin, which forms a protective barrier from environmental insults, is physically abnormal, extremely thin and no longer acts as a protective barrier for most rosacea sufferers. This abnormality, combined with blood vessels that dilate easily and often, leads to hyper-sensitive skin that reacts intensely to sun exposure. Therefore, one key to rosacea treatment is to find a protective barrier cream that does not agitate the skin and trigger redness flare ups and breakouts. Three substances have been shown in rosacea clinical studies to exert excellent skin protective actions – micronized zinc oxide, dimethicone and cyclomethicone. Well tolerated on rosacea skin. Skin protectants such as zinc oxide, dimethicone and cyclomethicone are usually non-irritating, non-sensitizing, non-allergenic and non-comedogenic to rosacea skin. 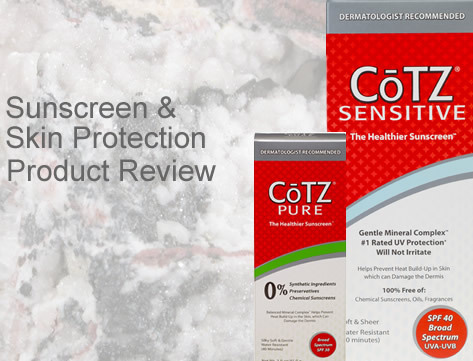 CoTZ sunblock has been around for many years with an excellent rosacea track record. We recently found out that they made substantial changes to their formulation and developed three new sunblocks/skin protectants that were ideal for rosacea skin. One of the most important changes was the development of a dual mineral base of Microfine Zinc Oxide and Microfine Titanium Dioxide. The addition of titanium dioxide makes the overall formulation more elegant and enhances protection. Photo-Sensitive Skin: Chemotherapy, radiation, including certain prescription and OTC medications. CoTZ has sunscreens for multiple skin types. This line of sunscreens comes in 6 formulations from 100% natural, sensitive formula and child sunblocks. Their SPF’s range from 30 to the ultimate block of 58. You also have the option for slightly tinted to natural and translucent as well. Review of our favorite CoTZ sunscreens for rosacea skin types. is the only product that contains pure microfine zinc oxide at the highest level possible (20%). This product is excellent for intolerant rosacea skin and post laser procedures.Who should choose CoTZ Sensitive:If you have severe redness, inflammation, thin steroid skin and/or reactive to many external triggers, COTZ Sensitive may be the best choice of treatment.Product Description:Gentle enough for special skin types and conditions including: Laser, Cosmetic Surgery, Microdermabrasion, Acid, Peel Acne, Rosacea Psoriasis, Eczema, Lupus/Rhuematology Sun-Sensitive due to medical procedure and medicationsCoTZ is formulated with a gentle mineral complex that also helps prevent premature skin aging (fine lines, wrinkles, sagging, age spots), uneven skin tone, and other serious problems. CoTZ sits invisibly on top of the skin and functions like thousands of mirrors to deflect UVA/UVB rays before the rays can touch or penetrate the skin. The sensitive formula is also gentle for use around the eye area which most chemical based sunscreens can irritate and sting. 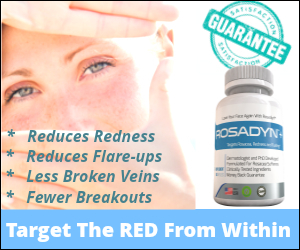 This is great for rosacea sufferers who also have ocular rosacea who often can not use skin care products due to eye irritation. CoTZ is 100% Free of chemical sunscreen ingredients. Make CoTZ a daily addition to your rosacea and sensitive skin care routine. Whats great is that CoTZ is a affordable skin protectant and sunscreen product that can be used not only for your rosacea skin but is also friendly for your family to use too. CoTZ is readily available online or at your favorite drug store as well as you can purchase directly from them at www.cotzskincare.com for $19.99 a tube. [message_box title=”Save on CoTZ Tip” color=”red”]CoTZ offer free shipping with purchase of over $25.00 or more so buy 2 and have one for on the go and one for at home. Everybody should be adding sunscreen and skin protection as part of their daily skin care routine. All people of all skin types sunscreen and protective barriers should be a part of your daily skin care regime and this is especially true for those who suffer from rosacea, have other skin issues or are medically sensitive due to medications or treatments. All it takes is a couple of seconds daily to apply sunscreen and skin protection which can provide you and your skin with great benefits including helping to protect you from additional harmful skin conditions related to sun damage and environmental agitations into the future. We care about you and the skin your in, so please protect it.